W3 Member Special! Not a member? Join free! Just in time for the holidays! This ready-to-play Bluetooth portable/wireless speaker with rechargeable battery delivers quality sound...wherever/whenever and makes a GREAT gift or stocking stuffer for the music lover on your list. Convenience and Quality No more bulky speakers or electronics with multiple incompatible plugs. Enjoy powerful sound from today's best portable speaker. Pairs wirelessly with Android, Apple and Blackberry devices, or to tablets and laptops. Compact and Powerful No Bluetooth? No Problem! Built-in 3.5mm jack works with all other devices. Advanced audio delivers 360 degrees of clarity and pop-up on/off feature with built in LED is sure to impress. 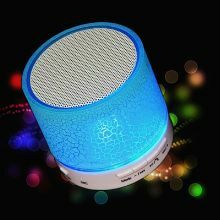 Pair and Play The wireless Bluetooth Speaker will save to your smartphone or tablet and be instantly accessible any time you want to listen to music. Pop up the top, and play your music! Nothing to physically connect or dock. On-The-Go Design Light and small enough to carry in a small bag, purse or backpack. Size: 70mm x 53mm (2.76 inches x 2.1 inches). Rechargeable lithium battery gives you up to 8 hours of usage time. Battery life is clearly displayed as the built in LED goes from blue to red.